I can’t believe it! I am so so excited to finally have these 12 lessons to offer to you! Years ago, I wrote a lesson a week on my blog. I called it Draw Your Life Mini Lessons. The response was positive and several asked for the lessons in book form. Though I made a couple of attempts at that, it just didn’t seem like the right container for the lessons. At the beginning of this year, I got the idea to expand the lessons into an ebook and video course. It is now complete and available in my ETSY shop. 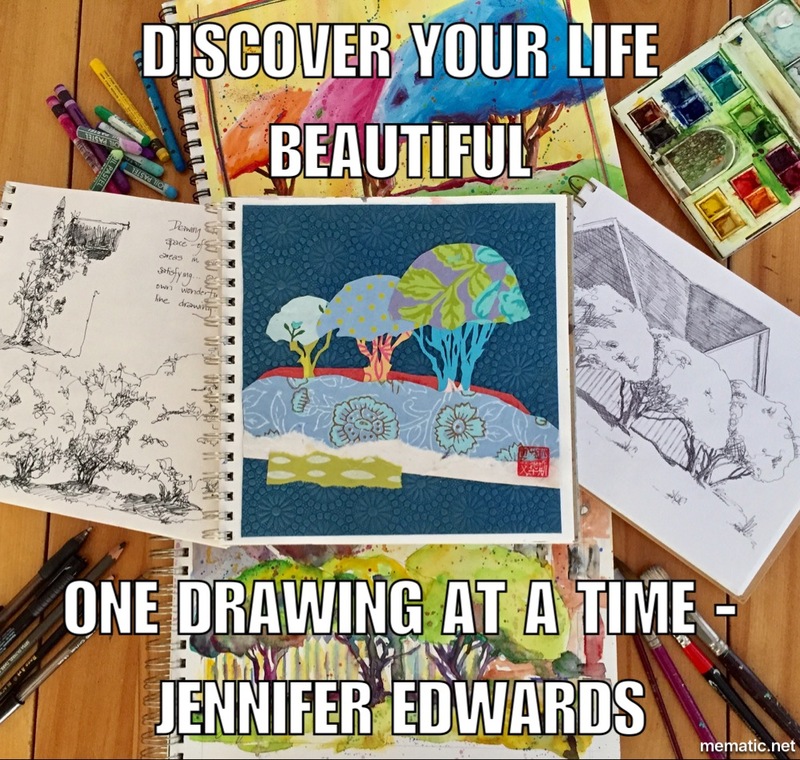 The self-guided course is now called Discover Your Life Beautiful, One Drawing At A Time. It is the same 12 Lessons compiled into a 64-page ebook instantly downloaded upon purchase. Each lesson has a password protected video to view which offers more discussion on that Lesson’s topic as well as a look inside my sketchbooks, filled over the last ten years. The course is equal parts inspiration and motivation, tips and techniques, as well as instruction for four different approaches to drawing. As you move through the lessons you will come full circle to Draw Up A Chair and begin again and again. The course is a comprehensive approach to seeking out and finding beauty in your everyday life. 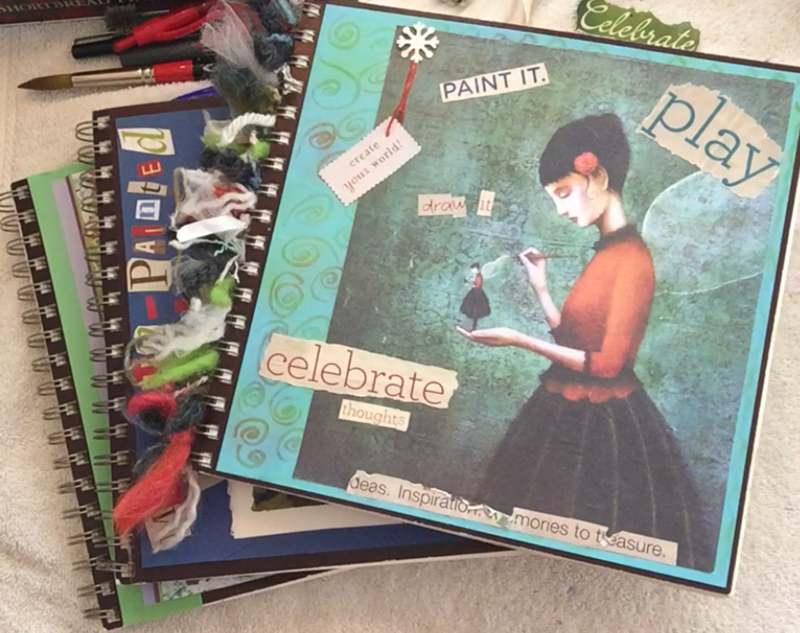 Everything from creative blocks you may experience, to tons of ideas for creating pages in your sketchbook, plus instruction for drawing in such a way that you experience your life more fully. Of all the creative endeavors I enjoy, this practice of drawing my life is at the center. From this daily habit, I’m enabled to see my life for the beauty that may be out in the open or hidden from view. It takes drawing to uncover it sometimes, and sketching it celebrates the life I’ve been granted. The overall emphasis in this course is DRAWING AS A PRACTICE, NOT AS A PRODUCT. My desire is that in working through the lessons, you will experience a freedom to drawcument your life without any burden to do so in a certain way or to have a polished product. We find love and beauty in the activity of drawing…not necessarily in the finished sketch. I offer this course to you for the reasonable price of $45. My hope is that anyone might feel they can begin this life-affirming activity of sketching and drawing their life. I would love to hear from you as to how it’s going, should you choose to purchase the course and work through the lessons. Whether you are a beginner at sketching or a seasoned artist, you will find something in this course to encourage and inspire you! Enjoying all your creative sides !!!! and coats of colors. Especially loved and followed, Liturgy of the Ordinary book as well as your podcasts during Lent. However, podcast #10 and all your exquisite tapestry’s and weavings just put me over the edge, in the best possible way. I always knew I should have learned how to crochet and knit but I didn’t. Now, inspired by you where can you recommend me to start online classes? Can you mentor me towards those classes? Totally am willing to pay forward. I have all your books and would only comment that I miss the color on the inside two of them as well as love, love the colorful inside pages of the other two. I hope you can think about this for me. I live in a very rual area but you gotta love the internet and its many hats, big time!! Away From Her; by Alice Munro. It was new to me and I found it quite by accident. It is a thoughtful story for some about loving and aging for others confirmation, comfort during and through their difficult journeys. Encouragement during this uncertain world we live in. I’m a world away from where I want to be, hopeful I can find my way with just a few well placed clicks. Thank you so much for all the artful beauty you share and bring to the table I am honored to have found and can follow your journey. Hi Diane…I am so glad my work here and other online places is providing some encouragement to you! Thank you for letting me know that. I wish you lived closer to me so you could attend my classes here. Since I am a face to face teacher, I am not very knowledgeable of what is available online. If I were you, I would go to Craftsy.com and check out their online course offerings which are some of the most reasonably priced online classes for all sorts of creative things!!! Then you can also check out Attic24 – http://attic24.typepad.com She is a british crocheter who offers picture tutorials of how to crochet simple things. You need to look in the left margin of her website to find her list of tutorials. But you might need a beginning crochet class first to get yourself familiar with it. I wish you all the best in your journey to learn to crochet or knit. I don’t know how far away a yarn shop is from you, but it might be worth a little trip for a one day class. Or you could ask around in your community to see if anyone knows how to knit or crochet and might be willing to teach you. Thank you for the book/movie recommendation. I will check that out.